Runners are always looking for something that could excite them, something that can give them a runner’s high. Some runners resort to faster pace whilst some runners go for longer distance races. More often than not, most runners prefer the latter. Evidently, a lot of runners are enjoying ultramarathons. And to experience a different kind of runner’s high, register for the upcoming Cardimax – Clark Ultramarathon. Individual, Team and Relay categories For race information, check the details below. Go to www.raceyaya.com , create an account and follow the registration procedures in the website. For those who are unable to register online, another person can register in your behalf. Note: This account is perpetual, you can use it for future registration in other races with ease. *Please ensure that you have read the (a) Race Details: Description, Qualifications, Restrictions and (b) Race Rules and Regulations. Runners have the option to pay online, via bank deposit or at the Second Wind Running Store. Runners who have paid online will automatically get their slots reserved. Non-online payment should be made ideally within 48 hours from registration, otherwise, slots will be re-opened to other runners. Registration will only be confirmed after payment. Registered participants are eligible to join the 18-week training program. These activities are spearheaded by the organising team, volunteer running teams , seasoned ultramarathoners, partners and sponsors. For more race details, please log on to www.clarkultramathon.com. 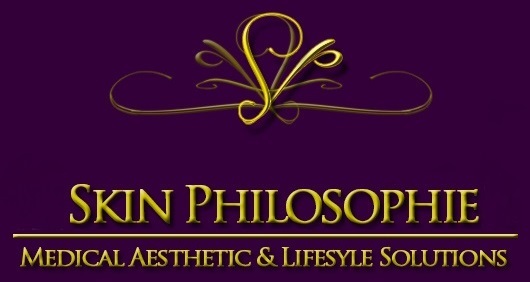 Register now and get on with your training! Runners are the kind of individuals who always crave for something new to challenge themselves. Like Caoch Roel Ano, he’s always looking for ways to give runners the best experience when they join a race. And from the usual Manila to somewhere out of town, there’s something this time. Say, what about from Sierra Madre in Tanay to Ultra (PhilSports Complex) in Pasig? 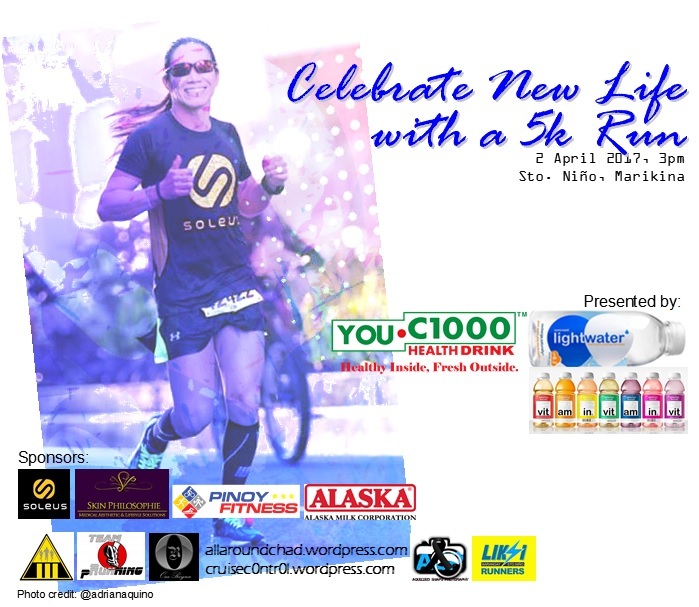 It’s a 50k ultramarathon that will let you experience running on a less travelled road from Tanay down to the metro. Well, it won’t hurt to condition your mind that it could be a little more than 50 kilometres. Sierra Madre to Ultra 50k Ultramarathon is happening on March 19-20, 2016. Do you have the guts to take on the challenge? Register now! You still have at least four weeks to work on your mileage. See you on race day! 2013 TNF 100: The Sweet Finish! It was getting dark and the route was going uphill. The cold air was adrift, refreshing, could even bring some chills down to your spine despite the rising body temperature. I caught up with at least ten runners and joined them through the trek. It was night time and staying with the pack was not only strategic, but it was also fun. We were a multinational group composed of runners South Korean, Malaysian, Indonesian, Irish (yes, that’s me) and Filipinos. From the time we left AS6, the route was practically a long stretch of uphill roads and trails. The light emanating from our headlamps guided us through the deserted roads and seemingly endless trails, lined up with trees and tall grasses on each side. Nocturnal birds and insects inhabiting the place have awaken, providing some background noise as we got farther into the forest. We had to look for TNF markers to stay on track. We can’t afford to lose some time here because we need to be at AS8 by 1am, and there’s roughly 20 kilometres of road and trails to grind. Looking up ahead, we could only see a silhouette of the peak of Mt. Sto. Tomas at 2,203 MASL. The night sky was clear of clouds. Far ahead, you can only see nothing but darkness. Having been in on the race for at least 18 hours, with sore muscles, limited food intake and the dropping temperature, each step towards the Peak was becoming a challenge. One of us took the liberty of leading the group while one stayed at the back so that no one got left behind, changing positions at some point. Every ten minutes or so, we halted for a three – minute rest to recharge or to squeeze in a power nap. Out team leader was very strict with time. The moment five minutes is over, it’s over. Everyone should get up and start moving in a single file making careful steps through the maze of trees, shrubs, boulders and everything in the forest. At almost midnight, a group of race marshals acknowledged our presence by making short bursts of light. When we reached AS7, we had our longest five minute break in three hours! We made it through the killer peak, all in one pack enjoying the precious three minute rests. AS8 is about three clicks away. I felt so much relief when we reached AS8. The marshals helped us with our food – soup, hard boiled eggs, a rice meal and hot drinks. We were an hour ahead of the 1am cut – off time. I couldn’t help but doze off whilst eating. The chilling midnight air was seeping through the jacket I was wearing sending my whole body to shiver. I was so sleepy that I found it quite difficult to resist curling up in an empty seat. When I learned that most of my companions have left, I asked for a cup of soup and hastened to catch up. I thought the soup wasn’t so hot. But I realised it was scalding hot when I took a sip from the cup. One thing I like about trail running is that there’s a lot of adventures and twists as you go along. Passing through the chicken wired gate, the cemented pavement ended up in a rocky downslope. While going up the peak was a big challenge, going downhill was a bigger challenge. The downhill course was very tricky. One misstep and you’ll end up rolling down the protruding sharp – edged rocks. We passed through a village, disturbing the stillness of the night. I could hear a soft music, though the tune was so unfamiliar to me, I knew that it was a song from the heart. Not so far away, a man was playing an accordion, his silhouette created by a light coming from the living room, his music soothing to the tired soul of the runners. It was like a welcome music to me, the sound fading as we got farther. Lesson 6. Remember, it’s all in the Mind. Hours passed. And in a couple of hours, we’ll see the first light of day. The dawn was breaking. The most treacherous part of the route was over. The trails led to the main road, where the marshals took our bib numbers for recording. The route included an alley in a residential compound, where domesticated dogs barked at the intruding strangers. The alley pointed to a dead end, and the only way to get going is to take hills. And I knew right there that it’s going to be another set of uphells. I was never wrong about it. Approximately, there’s still 15 kilometres to cover and I had about three hours until cut off. The morning temperature had again started creeping up. Thanks to the trees that shielded us from the burning rays of the sun. It helped delay muscle soreness. I had to do a lot of catching up, running whenever I had the chance, especially on downhills. I was starting to feel the exhaustion building up in me. I could feel some relief when I learned I was ten kilometres away from the finish line. I was hungry. My food and energy gels were all gone. I could only rely to my hydration pack. From trail to road, and now back to trail. And yes, it was another uphill route. And I was just hoping that it was the last stretch. I was just so grateful that the route marshals had some apples and salt in their station. I took a half of the apple to sustain the tiniest bit of energy that I had left. I wanted to just stop and sit down and be done with the race without crossing the finish line. My tired legs and sore muscles can only bear just a little more. But I had to remain focused. I slowed when necessary, and go back to running as soon as I recovered. Lesson 7. Always Say ‘Thank You”. More runners have taken the trails now, running towards my direction. I was on the verge of breaking down. Seeing my friends, receiving well wishes and congratulatory remarks, and a hug from a runner who do not even knew me was like getting a shot of adrenaline. I can see in their eyes and the expressions on their face how well they admired my courage to take on the 100k challenge. Thanks to the countless friends and strangers who selflessly pushed me to keep on. It was almost half past 8 in the morning. The last group of marshals stationed along the trails informed me that I was 200 metres from the finish line. I flushed my face with water to feel and look refreshed (I don’t want to cross the finish line looking groggy and wasted!). The sound coming from the audio system was getting louder with each step I took. More and more people were lined up along the side of the chute to the finish line arc. There were congratulations, woohoos, good jobs, and thundering claps as I dash towards the finish line. It was a sweet finish. I knew right there and then that the biggest smile was just painted all over my face. After having DNF’d in my first TNF 100 race in 2012, I told myself that I won’t suffer the same fate again. Although I must admit that that experience taught me valuable lessons, and gave me a new perspective on running, and in life in general. Around the 3rd quarter of 2012, I started with my training (which also coincided with my training for BDM 102) with much help and advice from elites and season ultramarathoners, and coaches. Whenever I don’t have a race on a Sunday, I took on the Pasig – Antipolo – Angono – Binganonan – Pasig route, completing at least 40 kilometres. And on any given day of the week, I do at least a 5k, alternating with my tempos and easy runs, and heat trainings. 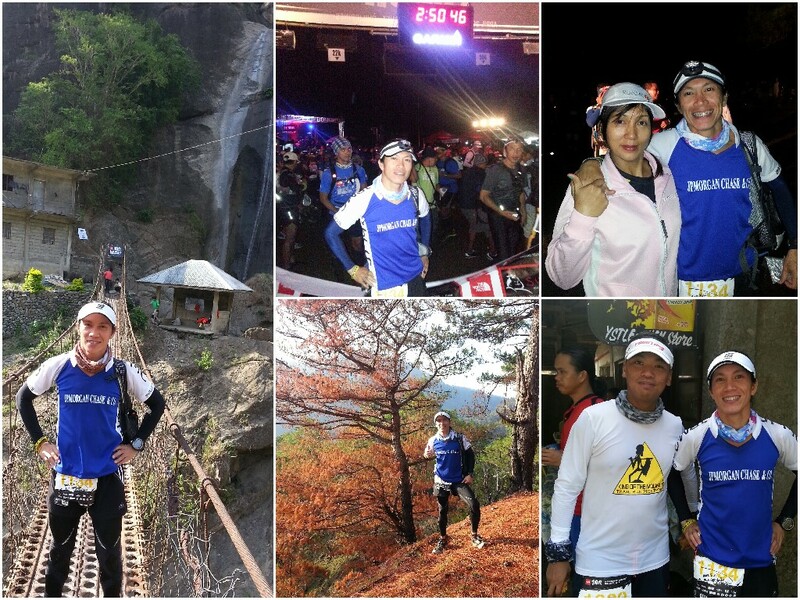 By the end of the March 2013, I felt that I was ready to face my greatest failure – the TNF 100. I was up for the challenge of trails and the mountains of Benguet and Baguio once again. I packed my bags complete with my running gear and the essentials of trail running. I booked myself a 10am ticket bound for Baguio which would get me there by around 6pm. I was able to get myself a seat for the 9:30am trip, though I had to pay an extra 50pesos for that seat. Well, 50 bucks didn’t matter that much as long I could get to Baguio much earlier. Arriving at the bus terminal, I contacted my associates Neil, Joey and Leo. It was raining that afternoon but we managed to drop our LP2 logistics at the race venue and got our race bibs. We’re all set, and we took our dinner slash carbo loading at an Italian resto at Camp John Hay. By nightfall, we rented a two – bed transient room near the race venue. We set our alarms at 1am. I said my prayers to gain some confidence and lay my trust in Him. Having learned the art of “sleeping right away”, I didn’t have a hard time dozing off. I felt some jitters as I took my place in the bed but shrugged them off. I woke up before the alarm took off and got myself ready. Soon, the three of us were heading to the race venue. The start line had a festive ambiance as the runners gathered up. The morning air smelled so fresh of pines. There was so much fun going around as the runners waited for the gun start at the wee hours of the chilly morning. Cameras flashed everywhere. Runners exchanged goodlucks and friends extended us their well wishes. With determination and prayers, I joined the runners in the 10 second countdown to gun start. Soon, we were treading the trails in the midst of the pines. Reflectors in the runners’ gears flashed in the darkness. Lights emanating from the headlamps and flashlights floated in the air like giant fireflies, moving away farther into the deep forest. Photos (clockwise from left): At LP2; Start Line; with Mommy Cleo (thanks for the send off wishes! ); with Doc Marc; somewhere between AS2 and AS3. By the break of dawn, I have gone past the Aid Station 2. I took a slice of pizza which was a leftover from last night’s dinner from my hydration pack for my breakfast. In the next few clicks, I will be eating uphills and I needed some energy reinforcement. I took advantage of the early morning when the temperature was cooler, gaining more mileage whenever I can. 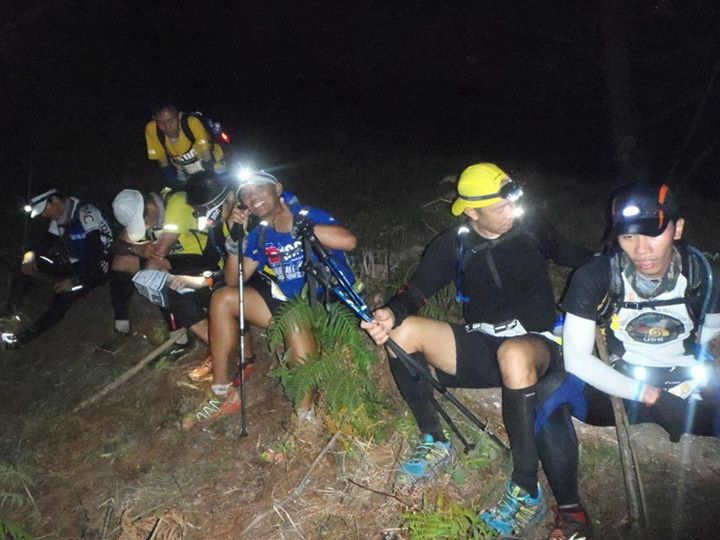 At half past 8, I was at Aid Station 3 where I met some ultra – friends. I knew that there wasn’t much time to waste so I went my way as soon as I was done with another breakfast. Trails and ridges came into view with each step, and the temperature started to creep up. The short rappel led to the moss forest. It was a pretty long trek, or so I thought. It was mid – morning when I reached Aid Station 4. A 15 – minute rest was all I need to get charged up. Despite having trained well, I didn’t escape from the killing muscle cramps. Frequent stops impeded my momentum, hydrating when necessary. But that didn’t distract my focus. The trail cleared into a partly concrete and partly rough road. Just like what I did in the previous year, I played Santa in Summer to the kids I met along the way – sharing with them the chocolates and some Jelly Ace I brought with me. The roads were deserted, except for some runners, and some occasional locales who could be on their way home. An hour to mid – day, I passed a village where race marshals and some residents were on a look for the runners. I stopped by and flushed my face with chlorine – free water. It was very refreshing. I had to exert as much twice the effort to make it to the LP2 (Km 53) by lunch time. The downhill slope was a blessing. And yes, I made it at LP2 minutes before 12. It was a relief reaching LP2 where lunch was waiting. It was time to get a much needed break and to gear up for the next leg of the race. It was an opportunity to gel with running friends and meet new friends. And I also got the chance to payback the kindness that my friends accorded me when I did BDM 102 the previous month. What was supposed to be a quick break extended to three hours and three – quarters. Most of the runners I met have already left, save for those who just arrived. At 4pm I set off for the second half of the race. I could still feel the burning heat of the sun as the rays cut through the woods. At Aid Station 6, I had my dose of the fruit flavoured Hydrite to ward off impending leg cramps. The liniment was a big help, too! The station had monoblock chairs, chocolate drinks, bananas, energy drinks and cold water for the runners. I took a seat in one of the monoblocks elevating my feet. I felt so much relief. But then I can’t stay there for as long as I wanted. I had to get moving. The peak of Mt. Sto. Tomas was waiting.